The direct cause of plaque psoriasis is still unknown to medical experts, but its development has been researched. It is an autoimmune disease – meaning that the symptoms are a result of the body over-producing defenses against something. In the case of plaque psoriasis, the body over-produces skin cells, causing a rapid build-up of skin cells on the surface, which become flaky and sore. In addition, inflammation of the joints may cause joint pain. There is not yet a cure for psoriasis, but treatments are available. One such treatment is Ixekizumab, also known as Taltz. The treatment – an 80mg/mL injection – was recently approved for use in adult patients with moderate-to-severe plaque psoriasis by the FDA in the United States. Clinical tests with joint pain symptoms, in particular, showed that ‘Taltz can provide significant improvement in joint symptoms’ in patients who have not been treated with such a drug before as well as those who have, according to Philip Mease, M.D., University of Washington and Swedish Medical Center. Taltz works by reducing the action of the body’s immune system, which is the main cause of plaque psoriasis. It does this by blocking a particular protein – Interleukin 17A (IL-17A) – which is responsible for promoting inflammation. Statistics available on the Taltz website show that 90% of patients with plaque psoriasis showed improvements with the drug, while 4 in 10 gained completely clear skin. 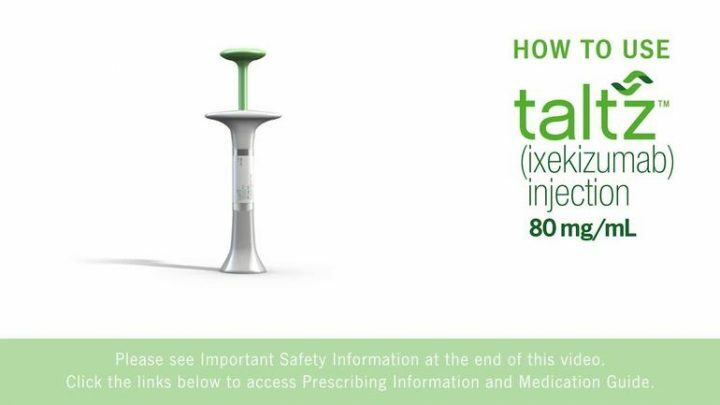 Common side effects include nausea, fungal infections and upper respiratory infections such as the common cold, and patients should talk to their healthcare providers before taking Taltz.